The embedding of colorful broken ceramic shards on the façade of monumental buildings is a common sight in the city of Huế, and the practice continues today as signifiers of new power and prestige in places like An Bằng. 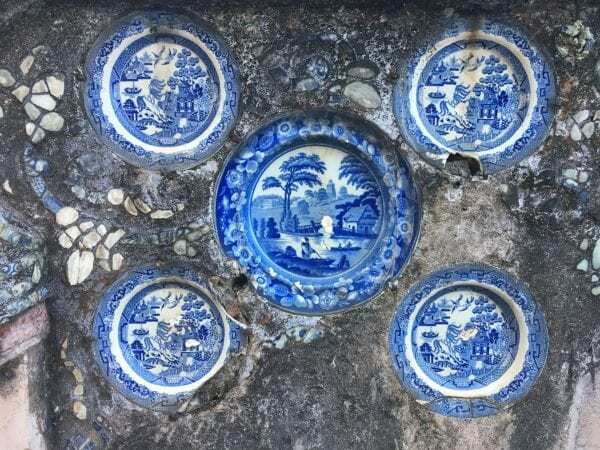 While a majority of these decorations were fragmentary ceramics imported from China, a curious exception could be found at the tomb Prince Kiên Thái Vương (1845-1876), the father of three Nguyễn emperors: Đồng Khánh, Hàm Nghi, and Kiến Phúc. More than thirty pieces of contemporaneous ceramics from England and Japan were found on the walls of the Prince’s tomb, situated near the tomb of Đồng Khánh. Complete and unbroken, these blue-and-white ceramics were the end product in the long process of global fascination and obsession with the blue-and-white porcelain from East Asia in the centuries before. Through an in-depth study of these ceramics’ placement, materiality, ornamental motifs, and manufacture and trade history, I attempt to uncover the multiple intersections of meanings generated by the display of these ceramics. Space will be central to my understanding of the tomb and the placement of the ceramics. Adopting David Summer’s concepts about real and virtual spaces, I build upon and expand on those to reflect the range of spatial experiences in my project: the surfacescape of the ornamentations on the ceramic plates, the space of tacit knowledge production through experimentation and the practice of artistic refabrication, the ideological space of display as a rhetorical practice that connects distant cultures and disparate times, the metaphysical cosmic space of a geomantically correct tomb, the political space of intra-Asian diplomacy and European colonialism, and the economic space of local and global maritime trade networks.